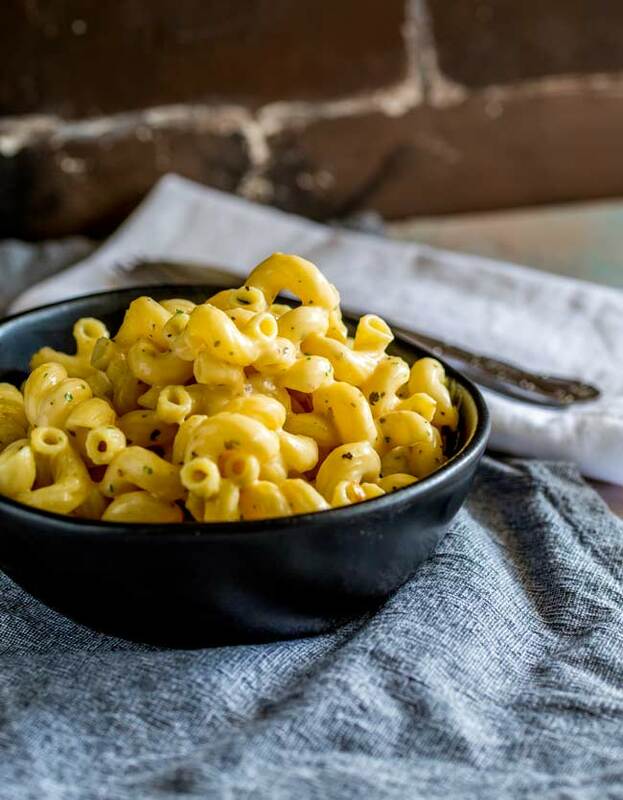 This vegetarian creamy herb pasta dish is the perfect side dish for chicken, for pork, for steak and dare I say it for turkey! Yes this simple pasta side would be perfect on the Holiday table. Or serve it as a quick and easy lunch! The creamy Italian herb sauce is super easy to make and the whole dish can be made in around 10 minutes! To make the delicious creamy herb sauce for this dish, we use a roux. This is simply a mixture of butter and flour. The butter stops the flour from clumping together when the hot liquid is added giving it chance to swell and thicken the sauce. People often steer away from sauces thickened with a roux, but they are actually very forgiving. The key is to cook the butter and flour mixture briefly and then add hot liquid to create the sauce. The dried herbs are added and then the sauce is simmered gently to thicken everything and to soften the herbs. How many will this dish serve? With some grilled chicken and a green salad the creamy herb pasta will easily serve 6 people. Or as part of your holiday table you can happily serve 8 people as they will be eating potato and vegetables as well. Because this dish is so quick, I will often serve it to the kids for a quick lunch on a Saturday or during the school holidays when they want a break from the term time sandwiches and wraps. The pictures in this post are from one such lunch, hence the small bowl! This is my portion, trying to get a picture of the full pan would have caused a lunchtime met down! You definitely can. It reheats well in the microwave or in the oven. I would recommend cooking the pasta slightly less than al dente because reheating will cook the pasta a little more and you don’t want soggy pasta. BUT!!!!! If you end up with leftovers don’t worry! The wonderful thing about making a cream sauce with a roux is that it will freeze and reheat wonderfully well! Try freezing any leftovers in ramekins, then when you want a comforting quick meal, top with a little cheese and bake. 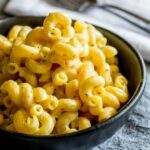 For another great Pasta Side Dish, why not check out my No Cream Italian Herb Pasta it is great as a side dish for chicken or steak! 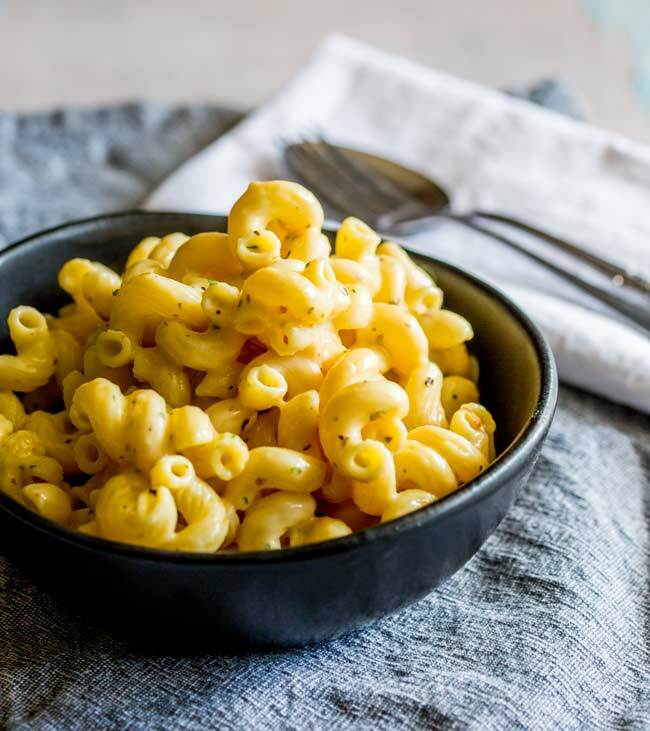 Why not pin this recipe for Easy Creamy Herb Pasta Pin it here. 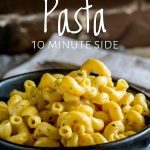 This vegetarian creamy pasta dish is the perfect side dish for chicken, for pork, for steak and dare I say it for turkey! Yes this simple pasta side would be perfect on the Holiday table. Or serve it as a quick and easy lunch! The creamy Italian herb sauce is super easy to make and the whole dish can be made in around 10 minutes! Bring a big pan of water to the boil, salt it generously and cook the pasta until al-dente. Whilst the pasta is cooking make the sauce. Melt the butter in a small sauce pan, once it starts to sizzle, reduce the heat and stir in the flour and turmeric. Mix them well together and then slowly add in the vegetable broth and whisk until lump free. Add the half and half, Italian herbs, chives and garlic powder. Cook for 3-4 minutes over a medium low heat. Add the drained pasta to the sauce and stir together, adding a splash of the pasta cooking water to get a consistency you like. 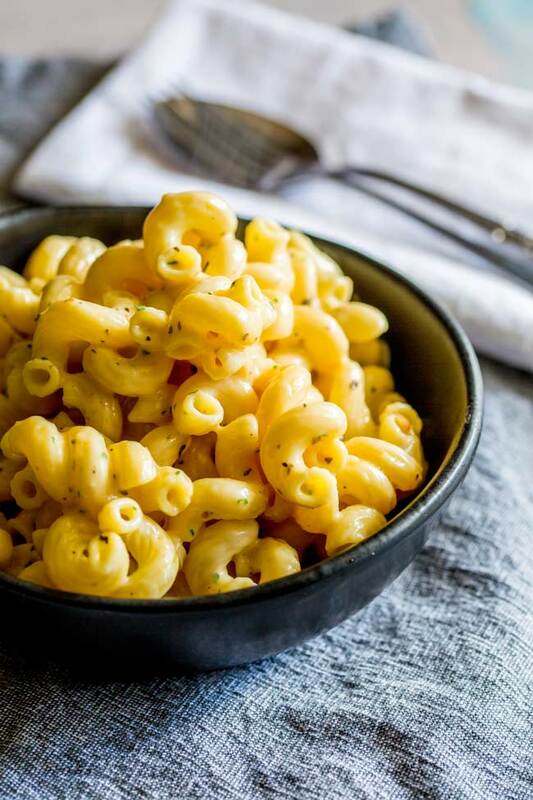 Use any small pasta, the pictures here use my favourite Cavatappi, but macaroni, fusilli, rotini, campanelle, or even pasta shells (conchiglie) will work well. I love recipes that are so quick yet absolutely delicious. Thanks for the recipe!